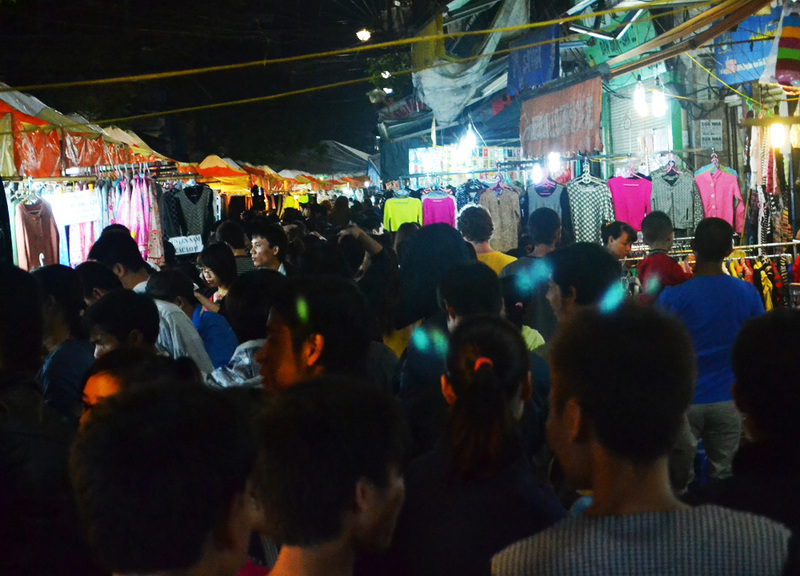 Every weekend, Friday to Sunday, 6pm to late, it is time for the Hanoi Night Market. 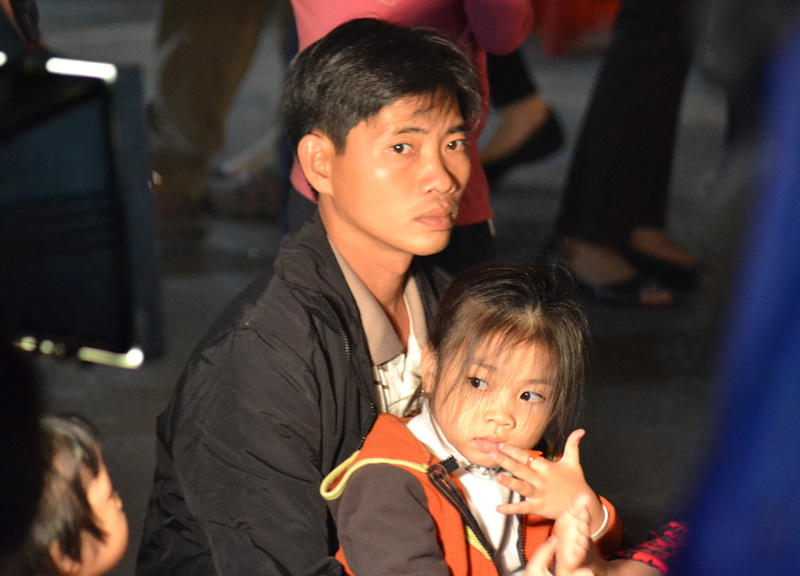 A Night Market which attracts crowds of epic proportions. In all my travels I have never seen a city centre transform to such an extent. From bustling traffic at daytime to a vehicle free pedestrian walkway at night. This takes place on the central Hang Dao Street one of the cities busiest stretches which splits through the centre of Hanoi’s Old Quarter. The market starts from Hoàn Kiếm Lakeside and runs the length of Hang Dao Street to the Dong Xuan Market. Spilling further with a run off of crowds on smaller side streets. It feels like everyone in Hanoi descends on this weekly event. 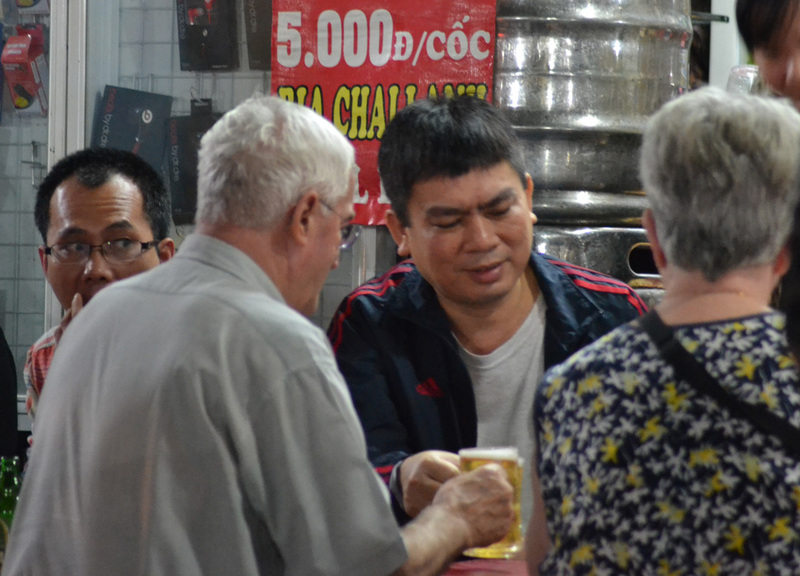 If in the Old Quarter area of Hanoi – the Hanoi Night Market is hard to miss. The shopping at Hanoi is no different from elsewhere in Asia. Clothes, trinkets, tourist bits and the occasional Asian cute. You can find them all spanning the length of the market. 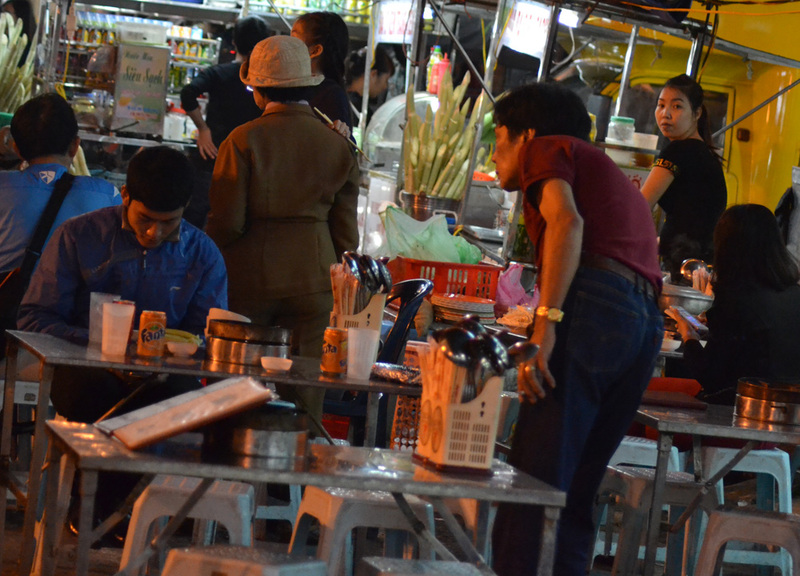 Finding the food is the more important part and while food is found dotted throughout the night market there are better places to track them down. 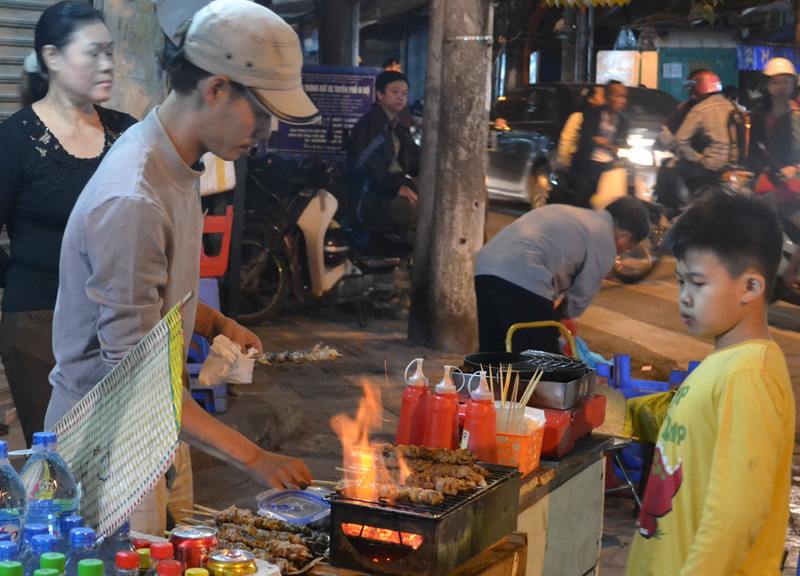 Much of the street food is found at street corners specifically the three intersections where the roads and traffic cut through the market. Expect roadside grills, meat filled baguettes and all sorts of Vietnamese treats. For a more relaxing feed food stalls and seating are erected next to the Dong Xuan Market area near the top end of the sprawl. Favourites here are the menus of Vietnamese dishes, Chinese Hot Pots and of course local beers. Plenty of eating to be done at Hanoi Night Market. 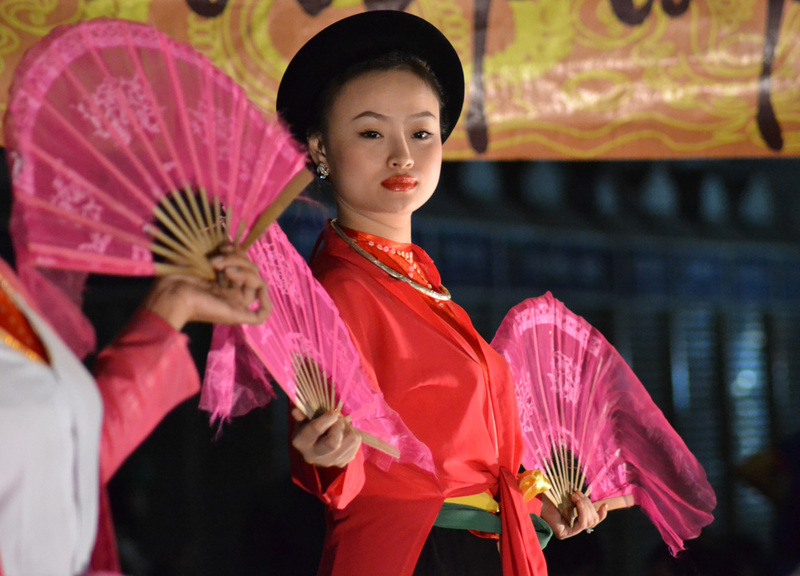 Occasionally you will find cultrual shows taking place at the top end of Hanoi Night Market, again next to the Dong Xuan Market (Hanoi Mua Dong memorial). Pictured below was a celebration for the Vietnamese Women’s Day. Crowded with kids and families. My preferred escape from Hanoi Night Market crowds follows Hang Bac Street; taking the 1st left onto Ta Hien Street (less than 150m). Here you find Hanoi’s famous Bia Hoi street an institute in Hanoi’s boozy youth culture. A street lined with super cheap beer and loitering teens. Hard to miss. Roadside Bia Hoi shops span in all directions from the central Bia Hoi Corner (where Ta Hien meets Luong Ngoc Quyen). This area is also popular with passing tourists and backpackers so feel free to join. 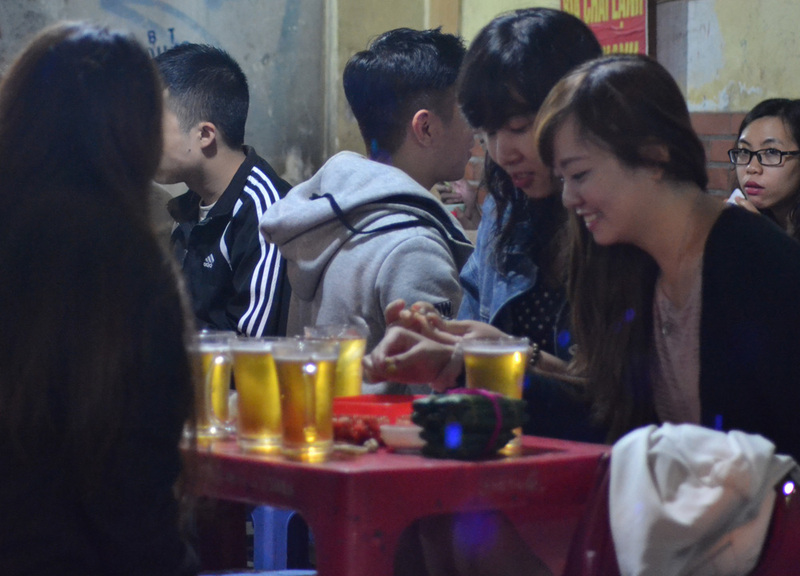 Hunker down on the tiny plastic chairs and make the most of 5,000 Dong beers ($0.24). By far the cheapest beer I have found in Asia.